The Music Soars As A Singer Burns Out In A Muddled 'Blaze' Critic David Edelstein says Ethan Hawke's new film about country singer-songwriter Blaze Foley is best at its simplest: "When [star Ben] Dickey performs, the movie is great." 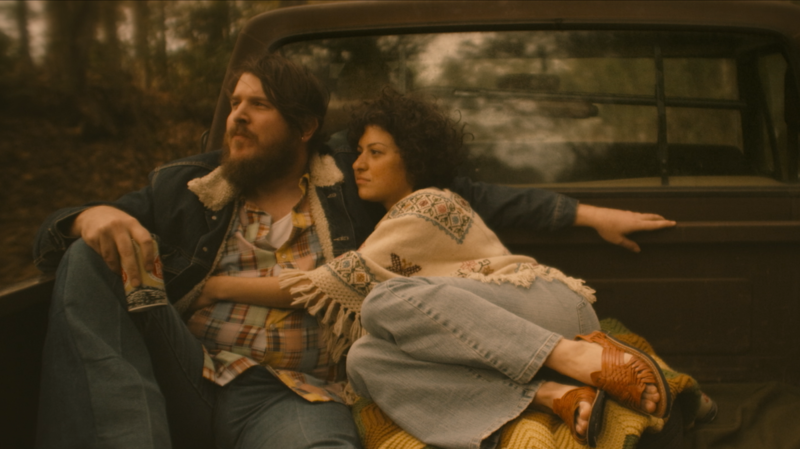 Singer-songwriter Blaze Foley (Ben Dickey) met Sybil Rosen (Alia Shawkat) in 1975. Later, the two lived together in a tree house in the woods. Dickey is a musician who has never acted before. Although he doesn't have that iconic country baritone, he makes you believe he wrote Foley's songs. When Dickey performs, the movie is great. Hawke plainly loves hanging out with him, the way musicians — and Hawke is one, too — sit around for hours, playing, talking, drinking. Cinematographer Steve Cosens frames shots in ways that seem loose but capture both the grain of a place and its aura, how it seeps into people. Throughout the film, Hawke keeps returning to Foley's last show at Austin's legendary Outhouse bar, where he's at the end of his tether but not — even whiskey-addled — his talent. Sadly, the rest of Blaze doesn't have that simplicity. It has fancy-pants technique — it's a flashback full of flash-forwards — and a limited vantage, that of Sybil Rosen, who co-wrote the screenplay with Hawke. Rosen met Foley in 1975 while working as an actress in a Georgia artist community. She lived with him in the woods in a tree house — hence her 2008 memoir's title, Living in a Woods in a Tree: Remembering Blaze Foley. Alia Shawkat, who plays Rosen, is an excellent actress, and she shores up the novice actor Dickey the way I imagine Sybil Rosen shored up Blaze. That's how Rosen presents it, anyway. She and director Hawke view Foley's life as a struggle between two poles: the nurturing life force symbolized by that tree house; and the death-driven road, where Foley wanted to be a legend, falling in with the drug-fueled singer-songwriter Townes Van Zandt. Van Zandt is played in Blaze by the charismatic musician Charlie Sexton. In one of the film's threads, he tells stories about Foley to a clueless radio host played by Hawke, seen only from behind. Van Zandt insists musicians need to "turn their backs on their families" and find a sphere apart, to the point of courting chaos. This is not, however, a film about the romance of self-destruction. If anything, it goes too far in the opposite direction, so that Foley and Van Zandt seem rudderless. Their scenes together are blurry, dull. They don't spark each other. Dickey's Foley is soft. While other characters allude to his frightening temper, he's more like a wayward teddy bear fated to stagger into a trap. Meanwhile, Hawke's syntax — the jumps from the Austin Outhouse concert to Van Zandt's radio interview to life in the tree house and back — muddles the momentum. He even inexplicably jumps forward and back within scenes. He's like a film student fiddling around in the editing room, and he makes a hash of the events leading up to Foley's violent death. The magic in Blaze is when time stops. In one scene, Foley, Rosen and Foley's sister, played by the musician Alynda Segarra, visit Foley's once-abusive, near-senile father, played by Kris Kristofferson. When Foley and his sister sing a sad, sweet duet for the old man, you can imagine Kristofferson hearing it on two levels, as the now childlike father and also as the singer-songwriter who knew the real Foley, Van Zandt and other musicians who burned themselves out, supposedly for art's sake. That's what Hawke accomplishes in Blaze, for all his silly directorial stutter steps: He makes you believe in the power of music to summon ghosts.